The most cost effective inorganic spray sealant on the market at a fraction the cost of its closest competitor. This is not your Fathers spray wax.... Unlike the others on the market which are organic wax or solvent based polymer sealant sprays Reload is an inorganic water-based formula composed from specially modified Silica (Sio2), glass nano components (5% total concentration). Reload is the most cost effective inorganic spray sealant on the market at a fraction the cost of its closest competitor. 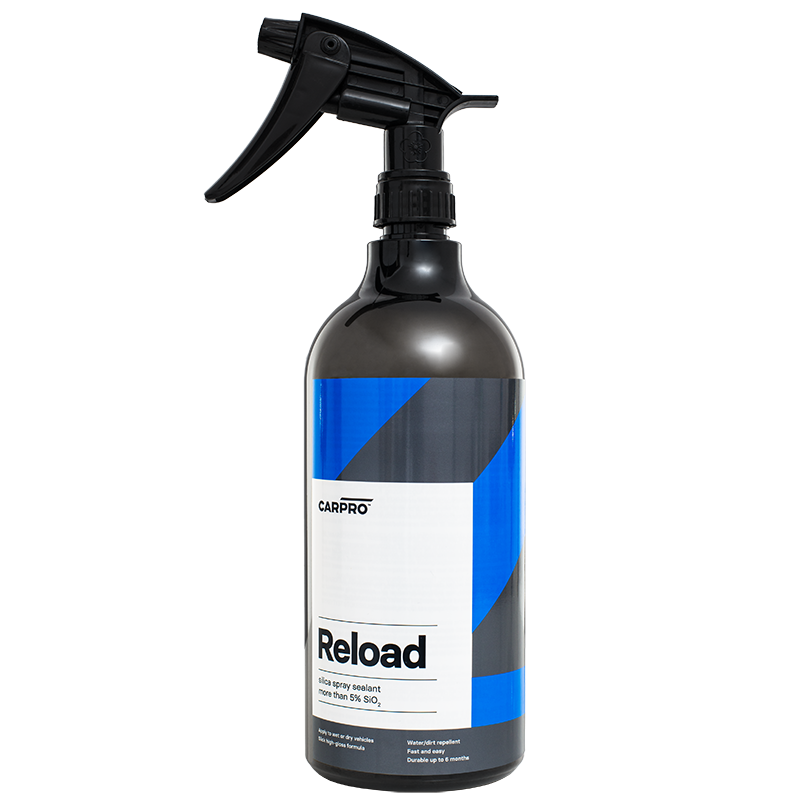 Reload offers a slick super hydrophobic layer which repels water like no other. Coupled with its ability to repel dirt & grime this leaves a stunning, glossy, and highly reflective shine. Very easy to use and ideal for enthusiastic or professionals alike. Once applied Reload makes washing the car easier and faster. You will also find the drying is no longer a chore as Reload leaves less water on the surfaces. Water-based formula mainly composed from special modified Silica (Sio2), glass based coating. 5% Total concentration. Fast and Easy: Even adding it to your washing routine during the drying process doesn't add much time to the wash.
An excellent topper for Cquartz as it enhances the lotus affect, adds slickness, and stays clean longer and easier unlike traditional organic sealants & carnauba waxes. Versatile and can be applied to a wet or dry surface. Apply to clean room temperature surface as follows. Use an mf towel to wipe, spread, then buff off immediately. As with any product, when pressing the trigger one quick press will allow it to disperse in a finer mist. Contain your work area to one section at a time rather than allowing overspray to land on a section you won't be buffing off right away. Some find the short weave microfiber towel to be the best option to wipe off with. Durability of Reload as a standalone sealant can vary widely based on environment, kept inside or out, proper prep to remove all oils, and the care it is given.